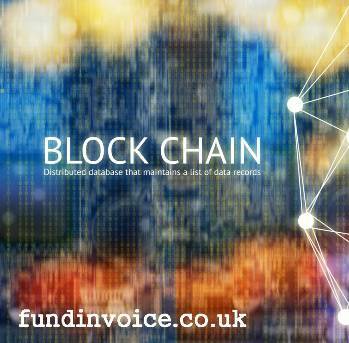 Can anyone explain the benefits, to an average SME, of using blockchain cryptocurrency invoice finance? The important distinction here is the benefits to the SME using the facility, rather than the investors backing the service and the benefits of cryptocurrency over and above the normal benefits of using invoice finance - with which we are acutely familiar as invoice finance brokers. I have watched with some interest two recent developments in the invoice finance arena. Two new invoice financing platforms have launched, focused around the use of cryptocurrencies as their USP (unique selling point). One of these was the subject of a previous post about the use of cryptocurrency invoice finance. Cryptocurrencies are standalone units of digital currency, that can be moved between parties, with all transactions being recorded on what is called the "blockchain". In this way there is no need for a bank. Usage can be almost anonymous, but with that comes a lack of recourse if you make a mistake. The anonymity has made cryptocurrency popular with criminal elements, such as those behind the recent payments demanded from the NHS (and others) in respect of ransomware that held some of their old computers hostage. The payments to release those computers had to be made in Bitcoin, the most popular of the cryptocurrencies. Benefits Of Cryptocurrency Invoice Finance? I have read how one of the benefits is making an invoice unique such that it cannot be sold twice (a benefit for the investors rather than the SMEs using the service). This is an age old problem within the sector, and all invoice finance companies have procedures to avoid duplicate invoices. The issue is often more to do with the ability to duplicate, or invent, the underlying transaction, rather than the invoice itself. But assuming that the use of cryptocurrency does reduce the chance of duplicate invoices, this seems to be a benefit to the investors that are backing the invoice finance company. Secondly, I can see that if you, the SME business, happened to hold or need cryptocurrency it might be an attractive idea. However, I have never heard any of our prospects or clients using cryptocurrency and I suspect that currency speculation is way beyond the skillset and risk appetite of most of the businesses that we come across. Assuming that invoice discounting for criminal elements is to be avoided, I am trying once again to understand the benefits to the average SME. I can see the attraction to investors that have seen the almost bubble like rise in the value of these cryptocurrencies - I can see that perhaps they want to invest in the hope of further gains. So perhaps this could draw in investors to back an invoice financier that might not otherwise be interested. However, there seems to be no shortage of people willing to put money into the invoice finance sector at present, so again I am not sure it's a major benefit for the SMEs in the invoice finance marketplace which is already oversupplied. Can You Explain The Benefits To An Average SME? So I come back to my initial question. Please can someone explain the benefits of cryptocurrency invoice financing to the average UK SME e.g. a recruiter, printer, haulier or manufacturer? Feel free to post your comments below.